Each one-of-a-kind stand is so singular, so unique, that it’s sometimes hard to let them go...when you consider you will never see another one exactly like it again. 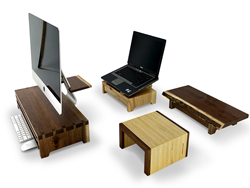 Understands innovative designers of one-of-a-kind iMac computer stands, rear-mounted iMac shelves, PC monitor stands and laptop supports today announces a full line up of urban wood stands that organize and elevate desktops with natural beauty. The Urban wood used for the stands is sustainably harvested from trees in urban areas and small towns that have lost their lives for a variety of reasons such as weather damage, building construction and disease. Traditional mills source trees from forests to mass produce lumber that is easy to work with and all looks the same. For convenience and consistency, they remove the uniquely beautiful color variation, funky grain, and the curvature of the outside of the tree called "live edge". Understands takes urban logs that would otherwise be turned into mulch and firewood and turns them into lasting one-of-a-kind wood products – each with distinctive color variation, grain and texture, as if they remember where they came from. Unlike plastic, metal or mass-produced wood products, Understands gives customers a totally unique, beautiful, and sustainable piece of nature for their home or office. Understands is a new division of Heartwood Creations, a 40-year-old woodworking shop known across North America for its exquisite secret boxes and jewelry chests. The Understands line up consists of the following products: Aspire, Bolt, Butler, Evo, The Ray, Planet and laptop supports. Urban wood sustainably harvested from northern Illinois and southern Wisconsin. One-of-a-kind products with fancy wood grain and special character. iMac Undermount for raising monitors to a more optimal viewing height with style. Cable Management that hides cables and devices in drawers while connected to power or computer. Live edge, v-fold, and dovetail construction. Contiguous wood grain across all surfaces. Light and dark wood tones (walnut, ash, cherry, hickory, oak, cedar, locust). 9” to 42” double widths (for two monitors). Drawers for storing iPads, smartphones, hard drives, paper, etc. Secret drawers for hiding checkbooks, cash, flash drives, secret notes. Apple Magic keyboard can be stored underneath. Weight/Stability-tested to support 50 pounds. MSRP: From $39 - $399. Heartwood Creations Inc. (heartwood.com): Heartwood Creations is the leading U.S. provider of exquisitely crafted wooden secret boxes and jewelry chests. Founded by Mike Fisher in 1978, Heartwood is located in Rockford, IL, near Chicago. Understands (understands.com): Understands is the tech accessory division of Heartwood Creations. Understands purpose, in cooperation with nature, is to enrich our work experience and promote a love for urban wood & workplace sustainability.